In the earlier post on Healing with Reiki , I mentioned that the system originated from the Tibetan Medicine Buddha Tantra Of Healing. 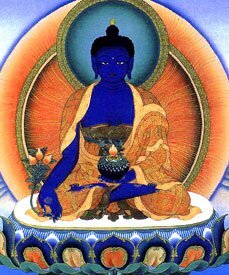 The Medicine Buddha, also known as Bhaisajyaguru, has an important place in the pantheon of Buddhas in Tibetan Buddhism. He is the healing aspect or Avatar of the Buddha Shakyamuni or Gautama Buddha as we know him. ‘an Asian body of beliefs and practices, which, working from the principle that the universe we experience is nothing other than the concrete manifestation of the divine energy of the Godhead that creates and maintains that universe, seeks to ritually appropriate and channel that energy within the human microcosm in creative and emancipatory ways’. In that context Tantra is a collection of rituals that seeks to attain certain abilities for the practioners. In the case of Reiki this ritual is confined to the empowerment by the Reiki Master. Tibetan Buddhism considers the Medicine Buddha Empowerment to be ‘a most powerful blessing for healing, dispelling sickness and awakening the innate healing wisdom that lies within each individual’. The Reiki Empowerment is an adaptation of that, with the same goal. It seeks to attain, for the practitioner, the ability to access healing energy. After the empowerment one is able to use the energy to heal oneself and others by applying the energy, which flows out through the centre of the hands, to specific chakra points. To do this one has to merely have an intention to heal. There are no other rituals or procedures necessary. Reiki adapts to any belief system and is also complementary in that it can be used to enhance any other system of medicine and also reduce any side effects. To understand the concept of energy healing we need to first understand our energy body and the energy circulatory system. Our being consists of the physical body, an energy body which surrounds it, referred to as the Aura, energy centers or the Chakras, and energy channels or meridians known as Nadis. The study of the energy system is vast and complex but a basic understanding is all that is needed here. The Aura, also known as the ‘subtle body’, surrounds the physical body and any external energy passes through it before it reaches us. It acts as a protective layer and a healthy Aura is said to have the ability to dispel any negative energy that comes our way. The health of the Aura depends on our physical, mental, emotional and spiritual processes. Physical exercise, positive mental emotional attitudes and spiritual activities like prayer, meditation etc, ensure a healthy Aura. Negation of the above causes the energy of the aura to deplete. Energy healing, in this case Reiki, also helps in ensuring a healthy Aura. There has to be a combination of all of the above for optimum health. None is more important than the other. Reiki and meditation help in fostering positive attitudes and a healthy lifestyle. But we need to have complete commitment and a desire to heal ourselves for any of this to work. Half hearted attempts will definitely not yield results. Another component of the energy body is the Chakra system. The first mention of Chakras is found in the Upanishads and these Vedic models were adapted into Tibetan medicine. They are best described as energy centers or energy nodes. While they are often depicted as flat discs at specific points in the body or just outside the body, they are actually more like funnels spiraling out from the body. They are in constant motion and energy is sucked in and released through them. Any stagnation in the motion of the chakras causes imbalances in health. This stagnation is caused by the same reasons that cause the depletion of the Aura. The chakra positions correspond to the endocrine system or the glandular system in the physical body. There are seven main chakras which are positioned just above the seven main glands. They affect the health of the glands and in turn the organs which are governed by the glands. Apart from this physical aspect they also govern mental, emotional and spiritual aspects. Each Chakra is in charge of certain aspects. Therefore holistic health depends on the health of the chakras. When any one chakra is affected this imbalance is transferred to the other chakras through the Nadis or Energy channels. Reiki energy is effective for healing and balancing the Chakras and clearing the Aura thereby ensuring holistic health. Regular application of the energy results in transformation and self growth. We learn to let go of unnecessary thoughts and emotional tangles and incorporate positive lifestyle changes. All it requires is about half an hour a day. We can invest at least that much time on ourselves!